Shareef Miller ranks among the country's top D-linemen. 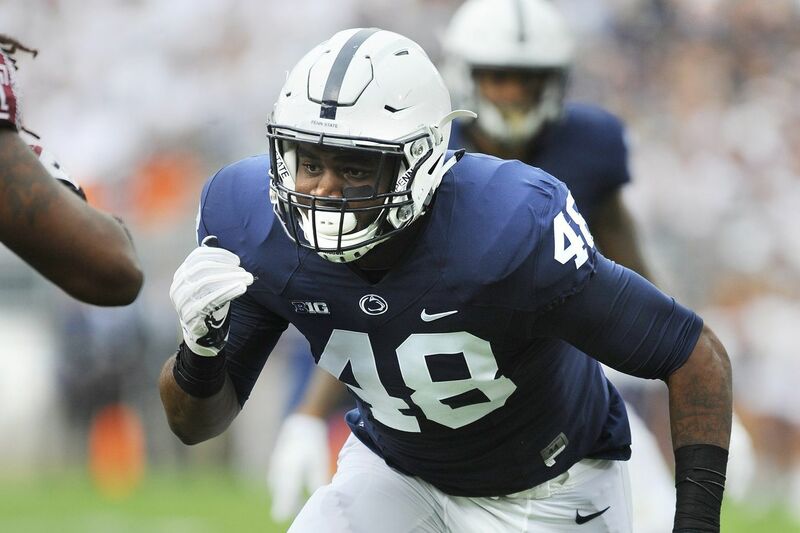 The George Washington High graduate earned third-team All-Big Ten honors last season, when he led the Nittany Lions with five sacks and 11 tackles for loss and had the most tackles (37) of any of the team's defensive linemen. Miller said he spent a lot of time this summer watching film and working with former Penn State star Deion Barnes in his hometown focusing on using his hands more. With a package that already includes speed, quickness and power, Miller could evolve into one of the Big Ten's best at his position this season. He has been named to the pre-season watch lists for the Bednarik Award (outstanding defensive player) and the Ted Hendricks Award (outstanding defensive end). Buchholz (Great Valley) has dropped almost 20 pounds from last season, when he would sometimes slide from defensive end inside to defensive tackle. Now he feels he is faster and quicker without losing strength. He is part of what will be at least a five-man rotation at end. He appeared in 10 games with six starts last season, missing three games after he suffered an injury on his first defensive snap against Ohio State. He has five career sacks. Toney (Imhotep Charter), who is now 46 pounds heavier than when he arrived on campus two years ago, impressed teammates, coaches, fans and even Penn State opponents with his explosiveness coming off the edge on the pass rush. He accounted for 6 ½ tackles for loss and four sacks, and forced fumbles on strip sacks against Georgia State and Northwestern. He ended the final possession against Michigan with a 9-yard sack of quarterback John O'Korn on fourth down. 6-3, 254, R-So., Laurel, Md. In his first season of college competition, Simmons showed flashes of being a contributor at defensive end. He played in all 13 games last season and accounted for 4 ½ tackles for loss, including his first career sack in the game against Michigan State. He will be part of the defensive end rotation but will push the guys ahead of him for more playing time. 6-5, 262, So., Spotsylvania, Va.
Gross-Matos was one of three true freshmen to appear in a game for Penn State in 2017. He played in all 13 contests and recorded three tackles in a game on three occasions. He also contributed a sack of Jake Browning in the Lions' Fiesta Bowl win over Washington. The versatile Givens gives defensive coordinator Brent Pry flexibility along the defensive front. Normally a tackle, he made his first start of last season at end against Michigan State, and started a total of five games for the Nittany Lions. He tied for second on the team with 3 ½ sacks, and posted career highs of four tackles in three separate games. He also led the defensive tackle group in the weight room during winter workouts, finishing first on the team with a 355-pound power clean and a 605-pound squat. 6-4, 304, R-Jr., Fond Du Lack, Wis.
Windsor showed last season that he had a nose for the football, recovering a team-best three fumbles which tied him for fourth in FBS. He came off the bench in all 13 games, and is a leading candidate to be one of the starters at defensive tackle this season. Shelton has received positive reviews early in training camp as he looks to earn a place in the defensive tackle rotation. He appeared in six games last season and was in on five tackles, and picked up a sack against Rutgers. 6-0, 305, R-So., Upper Marlboro, Md. Jordan appeared in seven games last season, getting in on nine tackles and combining with a teammate on his first career sack against Maryland. 6-4, 305, Fr., Owings Mills, Md. With the new NCAA redshirt rule, Mustipher is sure to see some early action given his fine showing early in training camp, and may be a candidate to play the entire season in the defensive tackle rotation. He was rated top 10 nationally at the position by recruiting services as a high school senior.